Background: Hepatitis C virus (HCV) infection is a global burden. There is no peptide vaccine found as modality to cure the disease is available due to the weak cellular immune response and the limitation to induce humoral immune response. Methods: Five predominated HCV subtypes in Indonesia (1a, 1b, 1c, 3a, and 3k) were aligned and the conserved regions were selected. Twenty alleles of class I MHC including HLA-A, HLA-B, and HLAC types were used to predict the potential epitopes by using NetMHCPan and IEDB. Eight alleles of HLA-DRB1, together with a combination of 3 alleles of HLA-DQA1 and 5 alleles of HLA-DQB1 were utilized for Class II MHC epitopes prediction using NetMHCIIPan and IEDB. LBtope and Ig- Pred were used to predict B cells epitopes. Moreover, proteasome analysis was performed by NetCTL and the stability of the epitopes in HLA was calculated using NetMHCStabPan for Class I. 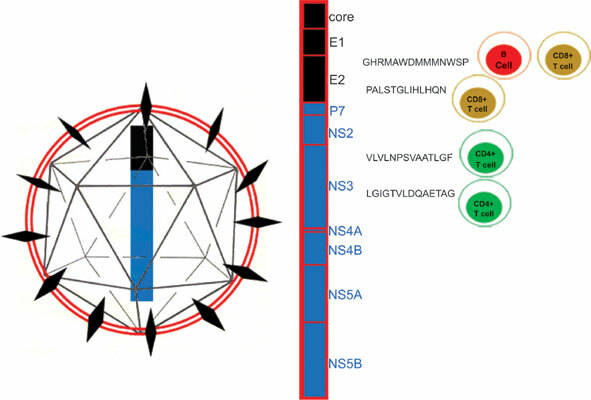 All predicted epitopes were analyzed for its antigenicity, toxicity, and stability. Population coverage, molecular docking and molecular dynamics were performed for several best epitopes. Results: The results showed that two best epitopes from envelop protein, GHRMAWDMMMNWSP (E1) and PALSTGLIHLHQN (E2) were selected as promising B cell and CD8+ T cell inducers. Other two peptides, LGIGTVLDQAETAG and VLVLNPSVAATLGF, taken from NS3 protein were selected as CD4+ T cell inducer. Conclusion: This study suggested the utilization of all four peptides to make a combinational peptide vaccine for in vivo study to prove its ability in inducing secondary response toward HCV. Keywords: HCV vaccine design, epitope prediction, in silico, Indonesia, cellular immune responses, humoral immune response. Keywords:HCV vaccine design, epitope prediction, in silico, Indonesia, cellular immune responses, humoral immune response. Abstract:Background: Hepatitis C virus (HCV) infection is a global burden. There is no peptide vaccine found as modality to cure the disease is available due to the weak cellular immune response and the limitation to induce humoral immune response.